Need advice on a great, reliable sedan! You are correct about the automatics being more efficient. GM (Chevy) has only been buiding reliable Chevy Cruzes for the past year or two. I would totally stay away from the older Cruze as those have a lot of problems. Seriously. 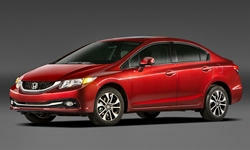 The 2012-2015 Civics were known for having lost the "Honda magic" because they drove like they took a step in the wrong direction compared to the 2006-2011. However, they have always been very reliable, even with the CVT. You are considering the 2015 Civic, but you should look for 2014s because they will be a little cheaper and the 2014 is exactly the same car. Skip the Cruze 1LT. Your boyfriend was wrong about the turbo and traction in the snow. Every FWD car will perform similarly. You need snow tires if you want to improve traction. Also, American cars are only marginally (not worth mentioning) cheaper to fix than Japanese cars, but they break down more than Toyotas, Honda, and Mazdas. I am going to suggest the cars that most people default to for good reasons. Mazda is a brand that builds reliable cars that don't have the premium purchase price of a Honda. The Mazda3 is a compact car like the Civic and Cruze, but is more fun to drive and reliable. I strongly suggest the Hatchback even if the Sedan gets 1-2 MPG better. The only drawback I see with this car is the road noise and the ride is bumpy (the tradeoffs for being fun to drive). My son has a 2015 and he loves it, though he wants the hatchback, not the sedan. I recommend a 2012 Mazda3 i Touring hatchback. The Touring is the best trim and the 2012s and newer have the much more efficient and more powerful engine. The reason I recommend the hatch is because you get twice the cargo space, visibility is better, and they are more stylish. The Toyota Corolla may not be the most fun car, but it is the most reliable. Almost all of them last past 200k miles with maintenance and are some of the most reliable cars on the road. This is the practical choice, not the emotional one. The main problem with this car is that the Mazda3 is not just reliable, but is also fun. The Corolla isn't. The Corolla is more comfortable and quieter than the Mazda. The Corolla is the most reliable compact car, but is only slightly better than the Honda or Mazda. I recommend 2011 or newer in the LE or S trim. Comparing these two to the Civic, I would choose the Mazda first, Civic second, and Corolla third. The 2012 Civic was so bad (in terms of quality and satisfaction, reliability was good) that they updated the Civic the next year, which is almost unheard of. The oldest your should go is 2013, but the 2014 is better. The 2013 and 2014 were actually pretty good cars. I recommend the EX trim, but the LX is also a decent value. The last I would consider is the Kia Forte. I like this one because they are a great value when bought used because they depreciate quickly. They are reliable and comfortable. I don't recommend a 2014 Forte LX because it doesn't have a backup camera, but the 2014 EX does. The 2015 LX can be had with a package that has a backup camera. Also if you are going to have kids soon you may want to consider a crossover like a Toyota RAV4 or small wagon like a Kia Soul so you don't have to buy another car abruptly. If you respond with your zip code we could find good car listings to help you. Good luck with your search and please tell us what you buy. Second to Lectrofuel's advice. GM overall makes better cars - the Cruze is not one of them. In 2017 they are already having trouble with engines, transmissions, and squeaks and rattles. The redesign was in 2017 so it should be avoided. Since you are wanting used, you have to avoid the older ones for the issues they had. It may be better in its second year (when GM generally fixes the quality on unit build) but that is too new for what you desire. Toyota Corolla is a tank of quality. In Consumer Reports every year the car gets the green circle of top overall quality. Literally no issues at all. The Corolla gets components that are older and established in Toyota's lineup after other cars get them so they are always reliable out of a redesign. The first blemish is after six years - that is when people say the brakes need work (probably brake pads and resufracing) which is maintenance and not really a repair. Exciting to drive? No. Economical? Yes. The Mazda 3 is also a good choice, but after about 7 years it starts having issues while the Toyota lasts closer to ten. Squeaks and rattles start up around this time At year 7 its problems start with the suspension. In car electronics have given some new owners fits as well (last few years of production). Paint issues also exist around year 9. Not major things, but not as trouble free as the Toyota. As Lectrofuel says, the driving is more enjoyable but if you are priortizing quality this is slightly worse. Honda Civic is a different matter and this is where I split with Lectrofuel. According to Consumer Reports and TrueDelta, there are some problems particularly where the recent redesign occured. For 2016 (redesign year) and 2017 the brakes are problematic. There are some squeaks and rattles in this design. Power equipment and in car electronics are problem areas as well. I would avoid those two years in particular. If you are looking before that - at the years 2012-2015, those are much better. Before 2012 they have issues as well. That one design for those four years are stronger in durability than before or after that period. So since you are looking at used cars if you stay in that time frame you will be better off. If you look at the Kia Forte you can also consider the Hyundai Elantra which is a very similar car (same engineering team designed both for the two companies). For the Kia, 2013-2016 (2014 redesign) are good years with very few issues. Climate system has some problems, paint and trim and squeaks and rattles are other issues. Occasional in car electronics issues - but they are cheap to fix and run for a very long time. The Hyundai is good from 2013-2017. It has even fewer issues than the Kia. Minor concerns with the brakes and in car electronics. That is it. The design of the Hyundai is a little better than the Kia in this case as it almost matches Toyota in quality (as good as Mazda and Honda, and maybe even better). In this case, better to stay away from the domestics. Ford Focus and Chevy Cruze just are not reliable enough, and the same goes for the Nissan Sentra and Fiat 500. I only said the 2012-2015 Civics were reliable because she can only barely afford these years for $8k. Before 2012 the Civics had premature tire and brake wear, peeling paint, and broken sunvisors (recall). 2006-2008 had a lot of cracked engine blocks, which is one of the worst problems you can have with a car. Before this were all the transmission failures that were common with Hondas. Also worth mentioning, new 2018 Hyundai Elantras can be had for $13k and they are decently equipped with a great warranty. Hi, I own nothing but Hondas and love them. I own a 2004 Honda Odyssey (135K miles) and a 2006 Honda CR-V (190K miles). I recently wanted to get a newer model for my daily driver. I did months of research and decided on the Honda Fit. I found a 2015 EX with 32K miles. I have owned it for three months now and I LOVE it! I get 40+/mpg on the highway. I love the tech and I love the "magic seats". Get a 2015 or newer Fit, you won't be sorry.